Who is ready for SOLID FOOD!!!! I have looked across the street all day today at Donatos Pizza and I my mouth is just watering thinking about it. I’m waking up extra early tomorrow so I can cook some eggs before its time to go to the gym. I have been planning my meals for the rest of the week because it’s so tempting to just binge after not eating for 3 days but to keep that from happening I am planning. The one huge question mark about this whole 3 day cleanse, how in the world do I have heartburn???? Really! I have had heartburn since last night. Now I have been getting some really good workouts in this week. I have been doing some older workouts that I have pulled out of the vault. There have been lots of squats that are making me sore, medicine ball toss, and wall sits with ab twists. Between those three Im having trouble getting out of my desk chair, and I have to get out of my chair 75 times a day! I did get on a new machine today that was a really neat one. 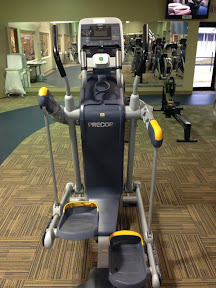 Its like a mix between a stair stepper and elliptical machine. Its harder than a regular elliptical, really simulates running which is going to help me get ready for Oak Barrel in April. If you don't have one of these at your gym you might want to ask about getting one! Its a nice machine. Ill spend more time on it tomorrow because now I know how good the workout is. Tomorrow no weights just cardio. My idea is the same as before, get to bed early (makes me not think about being hungry) and get up early for breakfast! I usually do something easy for breakfast but tomorrow Im hoping for something a little more special, something along the lines of an Egg Sandwich and an apple and 2 cups of coffee, and maybe string cheese and oatmeal....ok I have to stop!!!! Just promise me that the next time I think its a good idea to do a detox that it is not!!! Please help me remember that!